Every year, Vanderbilt University students and fans wait with great anticipation to line up for the baseball team’s new official poster and baseball signing. This very popular event, filled with spirited pomp and circumstance, draws Vandy enthusiasts eager to meet their favorite players and their coach, pose with them for photos, and have a treasured piece of memorabilia autographed. If supporters typically are excited for this annual pre-season event held at the Barnes & Noble at Vanderbilt University bookstore, imagine the thrill this year, as fervent fans came to the signing still charged by the Commodores’ 2014 College World Series win. The bookstore, managed by Barnes & Noble College since 2011, is located near Hawkins Field and Memorial Gym — prime real estate for maximizing its strong relationship with Vanderbilt Athletics and finding new ways to build partnerships. 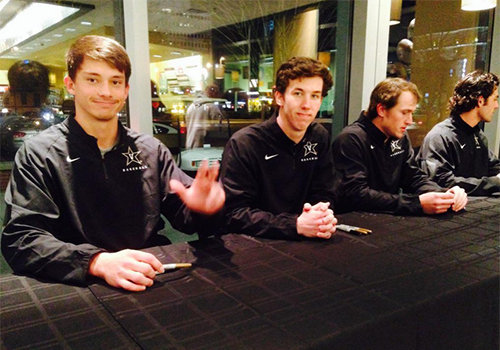 Members of the 2015 Vanderbilt Baseball team recently made an appearance at the Barnes & Noble at Vanderbilt University bookstore to sign memorabilia for Vandy fans. From left to right: Bryan Reynolds, Walker Buehler, Carson Fulmer and Dansby Swanson. During the bookstore’s signing event, Vandy fans came out to meet head baseball coach Tim Corbin and players Bryan Reynolds, Carson Fulmer, Dansby Swanson and Walker Buehler from the National Championship team. 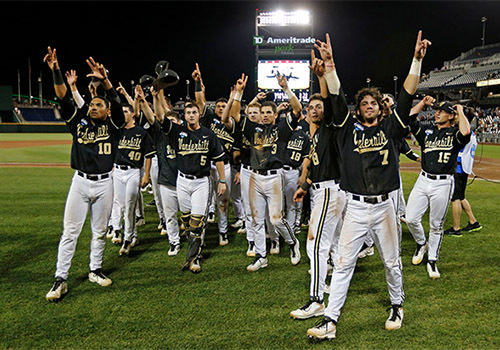 They showed their support by brandishing free baseball posters provided by Vanderbilt Athletics and purchasing National Championship baseball items for autographs. Fans also enjoyed a selection of refreshments provided by the Barnes & Noble at Vanderbilt Café and Ruth’s Chris Steakhouse. “This was the first time we held the signing as a stand-alone event, and not before a game,” said Kyle Parkinson, Vanderbilt’s director of baseball communications. 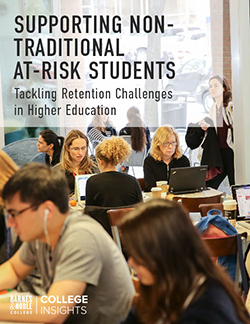 “There was no other reason to come down to campus except for this event — and we drew close to 100 people. It was really great.” School spirit was high with cheerleaders stirring up enthusiasm and fans taking photos with the national championship trophy. 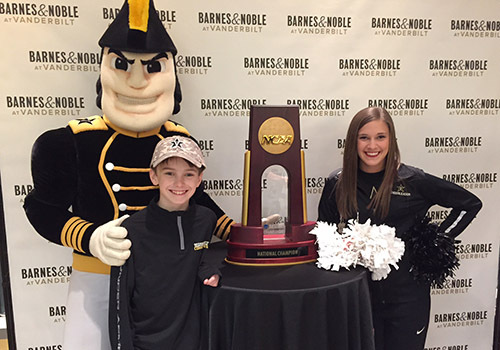 A young Vandy fan poses with Mr. C, Vanderbilt’s mascot, a Vanderbilt cheerleader and the 2014 World Series Championship trophy at the Baseball Signing event held at the Barnes & Noble at Vanderbilt University bookstore. During the banquet, the Barnes & Noble team set up a pop-up store where guests could buy Vandy merchandise and register to win a gift basket filled with College World Series paraphernalia, including a logo t-shirt, a baseball and a car flag. It also provided an opportunity to promote the upcoming in-store baseball team poster signing. 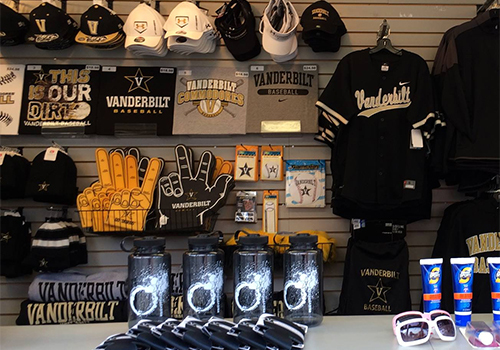 A display of Vanderbilt baseball merchandise is shown in the Barnes & Noble at Vanderbilt University trailer, which can take the bookstore directly to games.